Many hawker stalls that sell double boiled soups in Singapore offer rice such as pumpkin rice and yam rice. I’ll always order these if they’re available as they’re so flavorful compared to white rice. When you make it yourself at home, you can add more pumpkin and use whatever meat and ingredients that you fancy. One-pot rice is something I do often. I call this my lazy day meal as I don’t have to cook multiple dishes. Less dishes = less washing up. Am I the only one who hates cutting pumpkin? Well, I do love eating it but not the prepping part. So, if you’re like me, I recommend that you use Australian pumpkin for this recipe. They’re more expensive but totally worth it. I find cutting these pumpkins a breeze compared to the other varieties. Today, I cooked this rice with an ABC Soup. It’s very satisfying to have a piping hot soup to wash everything down. Equally as satisfying is to eat this rice with some bird’s eye chili. Super delicious! Related: Chinese ‘old fire’ soups. The Ox doesn’t eat chicken so I made this pumpkin rice with pork. You can also cook with chicken meat if you like. If using chicken, don’t use the breast meat as it would be too dry. After frying the rice and all other ingredients in a wok, transfer everything into a rice cooker. Don’t worry if the water level does not cover the rice. The pumpkin will release moisture when cooked. This is how the pumpkin rice looked when the cooking process was complete. 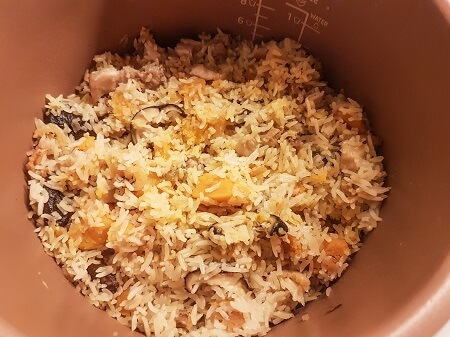 Do not stir the pumpkin rice immediately after it’s cooked in the rice cooker. I learnt this the hard way. I was so used to fluffing up cooked rice to loosen them that I didn’t give it a second thought. So I stirred as per normal and to my dismay, the rice started to turn mushy and the grains broke easily. Tip: If you need to stir the pumpkin rice, do so only when the it is halfway cooking or has cooled down. Love one-pot meals? Find more rice recipes here. 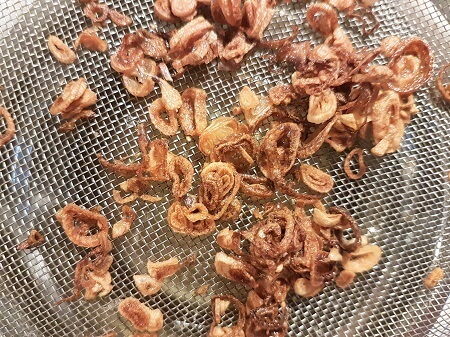 If you have time, fry up some shallots and add these crispy and delicious bits to the pumpkin rice. 1. 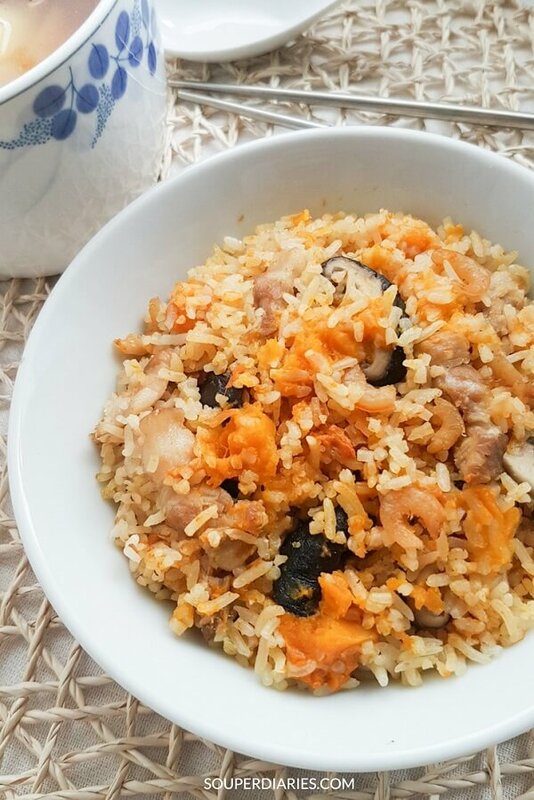 There are 2 ways you can cook this pumpkin rice using a rice cooker. You can either dry fry the rice together with all the ingredients or partially cook the ingredients (without rice) in a wok before transferring them into a rice cooker to cook with the rice. It does not matter which method you choose as it won’t affect the taste much, if at all. What’s more important is the amount of water used to get the right consistency for the rice. 2. Don’t stir the rice right after it has finished cooking. Doing so will release more moisture from the pumpkin resulting in gummy rice. 3. For vegetarians, substitute the meat with firm tofu or vegan ham. 4. Cut the shiitake mushrooms into slightly thick strips and the pork into long thin strips instead of cubes or small pieces. This will provide a better mouthfeel when eaten with the cooked pumpkin. This pumpkin rice is both savory and sweet at the same time. The dried salted fish and dried shrimps elevate the delicious rice up a notch. 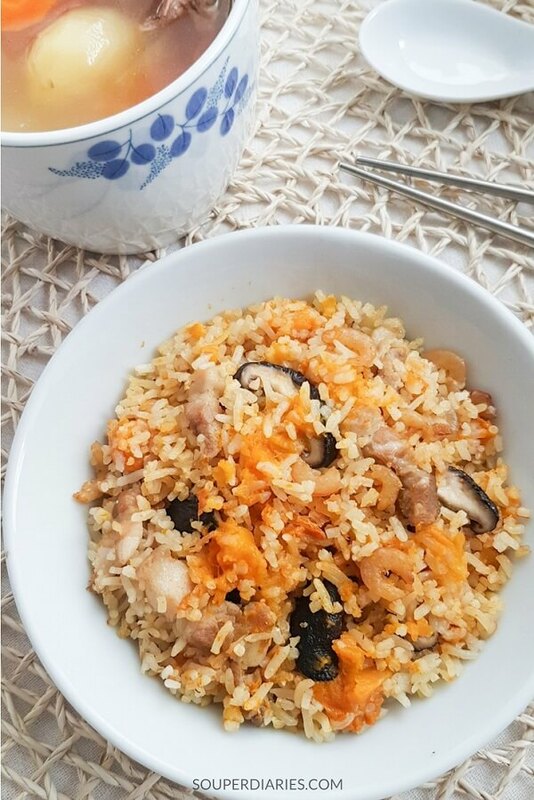 Try this rice cooker pumpkin rice recipe and let me know what you think. Thanks for reading and happy cooking! 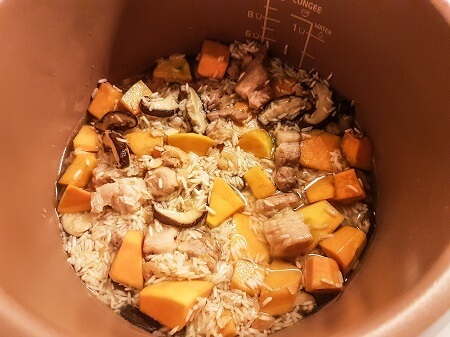 One-pot pumpkin rice with shiitake mushrooms and pork. Topped with crispy fried shallots and spring onions. Heat up oil in a wok. Using medium heat, fry the salted fish and dried shrimps for about a minute till fragrant. Add garlic and shallots and continue to stir-fry. Add pork. Fry for about 2 minutes. Followed by pumpkin and mushrooms and stir-fry for about about 1 - 2 minutes. Add rice and seasonings and mix everything well. Turn off heat. The ingredients do not have to be thoroughly cooked at this stage as the cooking will be completed in a rice cooker. Transfer everything in the wok into the rice pot. Place the rice pot next to your wok for easy transfer. Put the rice pot into the cooker. Add water and press start to begin the cooking process. Stir the rice halfway through the cooking process. Once the cooking process is complete, let rest for about 10 - 20 minutes for best results. Optional: garnish with some fried shallots and/or spring onions and serve. 1. Don't stir immediately after the rice has finished cooking. Doing so will release more moisture from the pumpkin resulting in gummy rice. If you have to stir, do it while the rice is halfway cooking (and don't stir so vigorously). Then let the cooker continue to do its job right to the end. 2. Cooking time will vary with different rice cookers, type of rice used and the cooking mode selected if using a fuzzy logic rice cooker. I used Jasmine long grain rice for this recipe. Oh, wow, does that ever look great!!!! My sweetheart loves all things pumpkin. I don’t know if she’s ever tried pumpkin rice though. And the shallots look like a nice touch. I just finished lunch but am already hungry again! I’ll give this one a try for sure. Well this dish sounds amazing! I will have to try this recipe out when pumpkins come into season again. Meanwhile I will bookmark this page. With that said I do not use a rice cooker as I steam my rice in traditional Persian cooking. Rice is also a main staple for us but because we use a long grain basmatti rice we wash parboil, strain and then steam the rice either plain or with additions (one pot meal too) so our rice comes out very light and fluffy. In doing a one pot rice dish we par-cook any additions and then layer it in our rice at the steaming stage. My grandmother makes a pumpkin and lamb khoresh (stew) which we serve with white rice on the side. This time I will try your recipe exact except I will steam it in our traditional style. Yum I can’t wait to find some pumpkin now! This looks yummy. Unfortunately I don’t know a lot about Chinese/Asian food but want to learn. I thought at the beginning that the rice alone was somehow flavored with pumpkin, but it seems the pumpkin is just added with the other ingredients? Also, you said “fry dried shrimps for awhile”, can you tell me how long awhile is? lol I will overcook everything if I don’t know timing. I look forward to more recipes. Thanks! This site is awesome! I’m Vietnamese and I love Asian food. Pumpkin rice sounds delicious for me. I bookmarked your site in my window now. This looks delicious. Does it really take only an hour to make it? I think I will get some ingredients to make tomorrow. Thanks for your comments! Even though the cooking time is stated as an hour on the recipe, the “real” cooking time for me was about 10 minutes with a wok on the stove. Once it is in the rice cooker, your job is more or less done as the cooker will complete the cooking process for you. Btw, I used a fuzzy logic rice cooker for this pumpkin rice. Cooking time may vary on different rice cooker brands. Looks delicious! Appreciate the great article! Keep up the good work. This sounds delicious! I don’t have a rice cooker, so I’ll be doing it over the stove. I love rice that has dried shrimps in it, they add some much yummy flavor!